While Saturday’s FOX card in Vancouver, BC, Canada is stacked with intriguing matchups and headlined by a pivotal welterweight showdown between Demian Maia and Carlos Condit, the action will be just as intense at 4:30pm ET / 1:30pm PT when the UFC FIGHT PASS portion of the card kicks off with three bouts that have a distinct local flavor. This is the UFC FIGHT PASS focus on Fight Night Vancouver. After blasting his way into the UFC with consecutive wins over Olivier Aubin-Mercier, Yosdenis Cedeno and Bryan Barberena, Chad Laprise is probably the last guy you would expect to be staring at a two-fight losing streak. 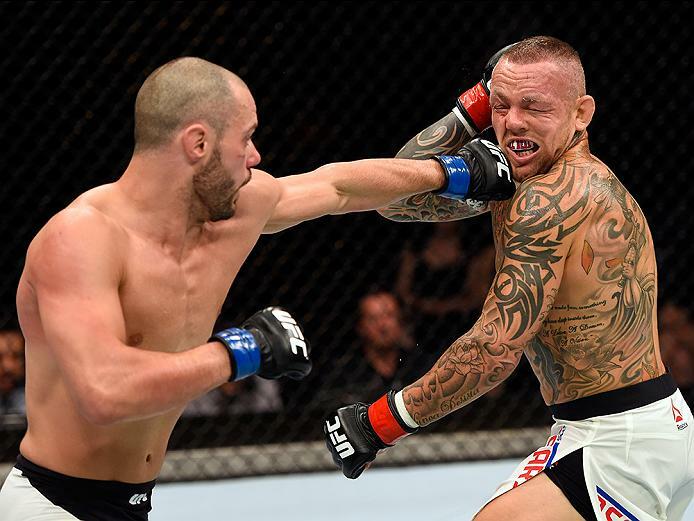 But such is life in the shark tank known as the UFC lightweight division, and while losing to veterans Francisco Trinaldo and Ross Pearson is no reason for “The Disciple” to hang his head, he knows that he needs a win on Saturday. Adding to the drama of this 155-pound clash is that France’s Thibault Gouti is in a similar situation, having run up an 11-0 record before losing two in a row to Teemu Packalen and Aubin-Mercier. So having your back against the wall does one of two things – you fade into the background or fight harder than you ever did. Expect to see these two bite down on their mouthpiece and put on a show for fans at Rogers Arena. The easiest way to break this fight between Adam Hunter and Ryan Janes down is to call it the classic “striker vs. grappler” matchup, and that’s fair. But Hunter is not a stick and move guy and Janes is not a lay and pray guy. That’s good news for every fan watching this fight. Ontario’s Hunter has finished all seven of his pro wins, six by knockout and four in 1:05 or less. In his last bout, he knocked out UFC vet Chris Dempsey in 40 seconds. As for BC’s Janes, seven of his eight wins have ended before the final bell, all by submission. Sure, it could go the three-round distance, but I wouldn’t expect it to. With an injury taking Josh Emmett out of Saturday’s bout, newcomer Jeremy Kennedy will now face fellow debutant (and fellow Canadian) Alessandro Ricci. That’s a lot to put on the shoulders of the highly regarded Kennedy, who is unbeaten, fighting in his home province and doing so against an opponent he wasn’t preparing for just a few days ago. But if history is any guide, 23-year-old prizefighters tend to not get rattled by much, so none of the above factors should determine how he performs this weekend. As for Ricci, the 34-year-old Muay Thai specialist really has nothing to lose here, but beating a top prospect on short notice and handing him his first defeat in the process would do wonders for making a memorable first impression in the Octagon.